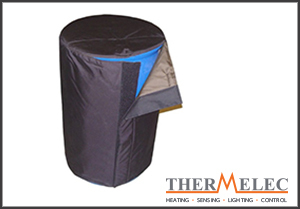 The insulated side drum heater is a simple yet effective heating jacket solution that can be used for a variety of drums and sizes. This type of jacket is particularly effective for plastic containers. 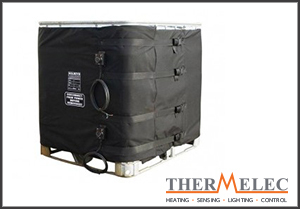 With its Class II double Teflon/Polyester insulation and 0-40˚C OR 0-90˚C thermostats, this heater is a perfect solution for the warming of a multitude of products including oils, fats and foodstuffs and an ideal heater of liquid materials that are stored within metal or plastic drums. The insulated side drum heater is built with adjustable quick release buckles to allow for easy installation and removal and comes in four standard sizes; 25L, 50L, 105L and 200L, although bespoke sizes can be manufactured to the customer’s needs. **Thermostats can be increased to 0-120˚C, however these are only suited for metal drums. The high temperature side drum heater is a higher power alternative to the insulated side drum heater, used for the heating of metal drums with an adjustable thermostat ranging from 0-220˚C. However, unlike the insulated side drum heater, these heaters are specifically designed to melt or reduce a products viscosity that require a higher power. Also manufactured with quick release buckles, the heater is stitched within an insulated silicone coated glass cloth jacket. 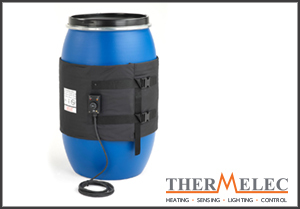 The silicone side drum heater is the ideal heater for products within drums. This simple spring fixed, double insulated silicone rubber heater is ideal for reducing the viscosity of materials such as fats, soaps, foodstuffs and chemicals. 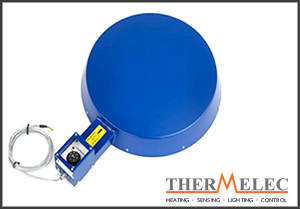 This side drum heater can be incorporated with either a 0-120˚C capillary thermostat or a 0-180˚C electronic thermostat that provides an accurate even heating through precise positioned PTFE coated, multi-stranded resistance wires. These heaters come in the usual standard sizes of 25L, 50L, 105L and 200L but can also be made to bespoke sizes. With its robust steel construction and even heat distribution, the base drum heater is specifically designed to melt and reduce the viscosity of soaps, fats, waxes, varnishes and oil based products. 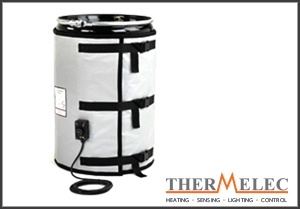 The base drum heater uses a 0-150˚C thermostat and has both 110V and 230V option. If the requirement is a rapid heat up of a product or a higher power is needed then the versatility of the base drum heater means it can be used in conjunction with a silicone side drum heater or thermally insulated jackets. The diameter of the base drum heater allows for use on drum sizes of up to 200L. Non heated insulated jackets provide a cost effective means of minimising heat loss that allows for an extended process temperature. The Teflon/polyester jacket not only creates thermal insulation but also water resistance and can be used in conjunction with silicone side drum heaters, insulated side drum heaters, base drum heaters and comes in standard (25L, 50L, 105L and 200L) and bespoke sizes. It is easy to install and the jacket assists with any environmental factors such as chill, frost wind and cold temperatures. Intermediate Bulk Container (IBC) Insulated Jackets and Lids provide an efficient heating system which is perfect for reducing the viscosity of a variety of products. Its Teflon/polyester insulation, dual power circuits and 0-40˚C or 0-90˚C thermostats has made this an ideal heater for intermediate bulk containers throughout the world. It has quick release and adjustable buckles for easy installation and removal and is also designed with an upper and lower heat zones which are controlled via two separate thermostatic controls. Unlike expensive conventional ovens, this heater allows for an IBC to be heated at its point of use and with 1000W per zone and an optional insulation lid, this heater is a cost effective way of heating an IBC. For the heating of any product contained within a bag-in-a-box solution, the silicone mat heater is the perfect solution. This silicone rubber insulated heater comes in standard 1000L sizes (bespoke sizes made to offer) and has a 0-150˚C electronic controller with a built in residual current device. There are two types of heater available, the silicone mat heater that can be used below the container liner before filling, which in conjunction with the digital temperature controller, provides accurate and direct heating of the liner contents. Another available is an insulation jacket that covers all four sides and a lid which can also aid the heating time. Watlow is a world renowned producer and innovator of heating elements. With premium materials and tight manufacturing controls, Watlow’s cartridge heaters provide superior heat transfer, uniform temperatures, resistance to oxidation and corrosion and long life even at high temperatures. Customers benefit from Watlow’s custom designs, on-time delivery, quality and technical assistance.